It is an interesting fact of the human condition that not only can one rarely understand the life situation of another human being but one can rarely understand the physical challenges of an age one has not yet reached. My father was a great athlete. He played college football, he played baseball and basketball. His uncle Max "Mac" Kinsbrunner was inducted into the New York Basketball hall of fame. My dad was a sport counselor in his youth and I always saw him in that light; a father, a rabbi and an athlete. Seeing him grow old was difficult. Why couldn't he stand straight anymore? Only after his death did I began to understand the extent of his constant pain, mostly due to sports injuries inflicted in his early years. Flashback, 2002, Karate College. I am chatting with my dear friend and teacher Arthur Cohen, Joe Hess, 10th dan black belt, champion kickboxer, all around American hero, comes walking down the stairs. The man was in obvious pain and was having a great deal of trouble. Arthur pointed out to me the dangers of injuries and the need to be careful. Sadly Arthur's own untimely death was connected with martial arts inflicted injuries. Arthur, Prof. Cohen, warned me to take care of my body if I wished to continue traveling and teaching. I took those words of wisdom to heart. I try not only to protect my own body but to guide my students to safe training. Remember...the lucky ones will someday be old man and old women. Old Age...it is a Drag...ain't it? 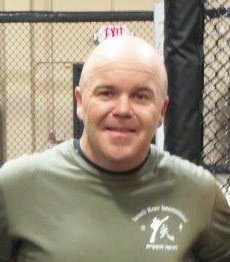 Bryan Ward is a certified IKI instructor and a veteran police officer. He has devoted his life to making young and old feel safe in every environment. His safety program and TV show for kids has earned international acclaim. Senior ‘Constable Bryan’ Ward, Q.S.M. Let’s face it, as we grow older, we become more of a target to those who, lets say – have an inclination to prey on apparently weaker targets…so I believe it makes total sense to learn some effective self defence through a regular program and get help staying fit at the same time. But let’s not be fooled here I am yet to see or hear of an 87 year old who will take on a room full of twenty somethings and remain unscathed. So don’t wish for the impossible ….That and hopefully by that age you will be more interested in living a peaceful existence. I appreciate the fact that as your body grows older there are more physical challenges. So to keep working your body, exercising sensibly and to participating in functional exercise will no doubt help your body and your mind…to do so takes real effort. But what are the realities of getting older and continuing to train ??? I discovered yoga a few years back and despite being the ‘man of steel’ of yoga according to my wife’s instructor, fully recommend giving it a go and getting yourself into a 10-15 stretching programme every night or on your off days….while I will never be ‘bendy’ so far in my life (touch wood) I still walk without back or joint pain. Many injuries we get in martial arts/self defence classes are purely from ego and the desire to keep up with the young ones. Be SMART and lets not be a huckleberry here, it tweaks then stop, rest and get it treated properly and if that means you miss a few weeks of lessons so what ….it ain’t the end of the world (it might feel like it but it isn’t). Study an art or style that is age (and wisdom) appropriate …as the UFC often shows a warriors heart doesn’t make up sometimes for a young person’s bravado and youth. One of the reasons I am an IKI instructor/student is because IKI constantly adapts it’s training and doesn’t rely on force for the technique to work . I see vast amounts of Krav Maga techniques that a 24 year old fit person could do but not that many that an amputee or elderly person could do with just as much success. As Moshe Katz said to me in an email once (and I believe he is right) “we do not do stupid macho badass training. As such our system is perfectly suited to keep your body in tact as you age. Of course accidents do happen but not like in other styles. We train with the knowledge that you mention here. It is not only the student, as you advise, who should be cautious, but the teacher and the entire system. That is precisely how IKI is designed, and that is one of the main points of attack. We do not rely upon force but rather upon an intelligent system.” To me that is a mark of a smart person, smart system and most importantly smart training. I had the pleasure of watching a martial art class recently where a senior student aged in his fifties spent the entire class basically being a punching bag and grappling dummy for the younger members of the club. When the class was finished he came off physically and spiritually broken and as he walked past me he said …jeepers I don’t know how many years I have left doing this ….no surprise there. 50 years olds cant train like they are 23 ….it defies nature and common sense. Beware of an old man in a profession where men usually die young. Old warriors did not get old by accident; they got old by being wise, having the right knowledge, and being tough. Never underestimate an old man who has grown up in a rough profession or a rough environment. These men have been around. They have done things, and experienced things, that you probably have never even thought about. They are tough, their minds are tough, and they have the knowledge, the skill, and the will to finish you off, if you force them to do so.